Hello everyone! Thank goodness it is finally Friday Saturday. This week was a long one! As you’ve probably heard me say before, my school has the unique opportunity to try some new initiatives (does anyone else feel like that is a four letter word? lol) this year. Basically, without going into the nitty gritty details using lots of big words and acronyms, our school has a lot of needs and is not performing as well as we would like therefore the state is encouraging us to change it up a bit. I use the word encourage purposefully here… it is quite the different vibe from when (in another building, same district) we were not making AYP under No Child Left Behind. Long story short, there are a number of things we are trying this year and you will probably hear more about them later- in regards to this week though it meant coming back for 4 full days of professional development before the rest of the district officially comes back next week. So this was my view all week long…. enough said. And when I wasn’t professionally developing I was attempting to battle this disaster. Every spare minute that I could squeeze out of my day was spent in here. We have open house on Tuesday night… I might be ready. While I have a lot of great storage in my room (as you saw if you watched any of my room periscopes), I’m missing a giant walk in closet that I had in my old room. There is a lot of stuff that I don’t need this year (former grade levels etc.) but I don’t want to bring it home since we’re going to be moving in a few weeks, and I just don’t have the time to sort through it all right now. So this is my solution for now! 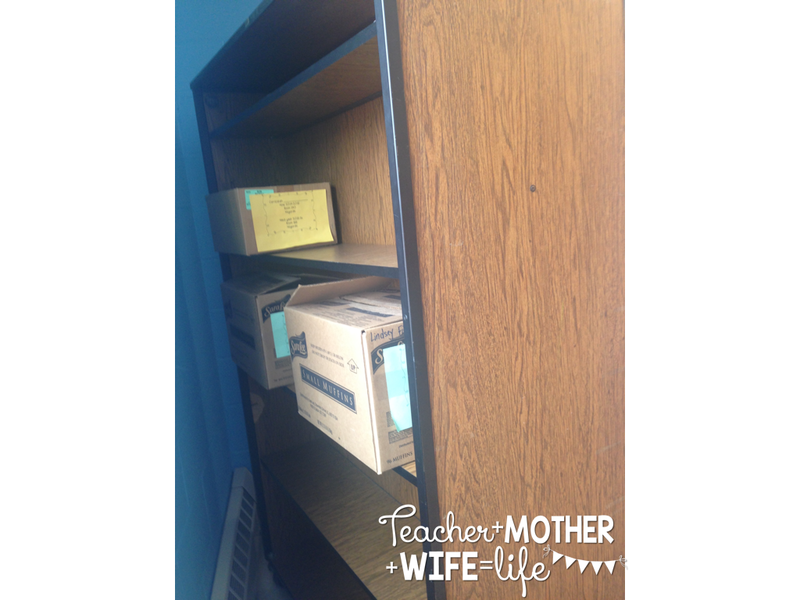 I have this large double sided bookshelf in my room… and my boxes of randomness fit/ hide perfectly on the back side! Score!! I had a dear colleague text me Thursday evening to see how the week was going… I sent her this pic. It was 6:45 and I was still at school (had been there since 7am). This year we are having family meetings/ goal setting before school starts and we were required to call each family to set up an appointment. I do not like talking on the phone :-/ Bad, I know, but I did it! I only got through to a few families, but it was very cool to make the connection this early in the year 🙂 Even though it was out of my comfort zone I will definitely do it again next year. On Friday my team got together for a grade level meeting (because we just didn’t have enough meetings this week!) 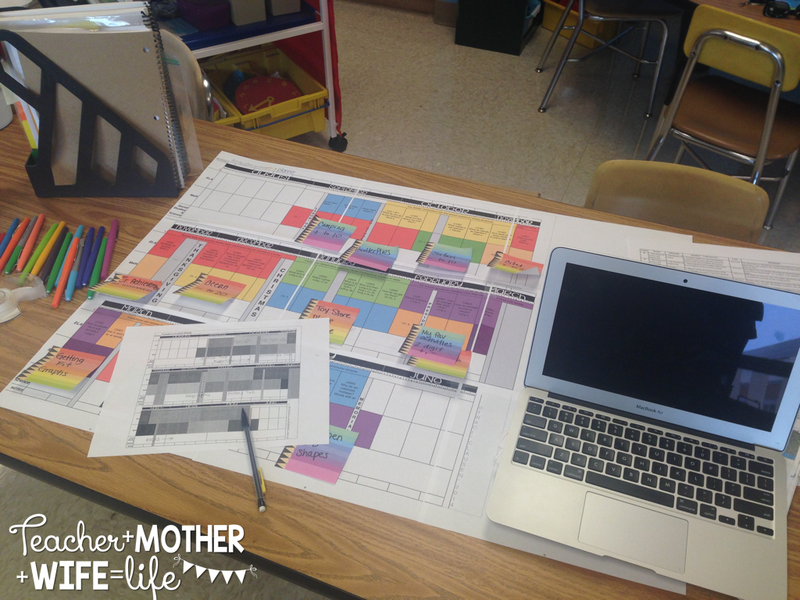 and this was the highlight of my week- Look at all that color coded planning amazingness! 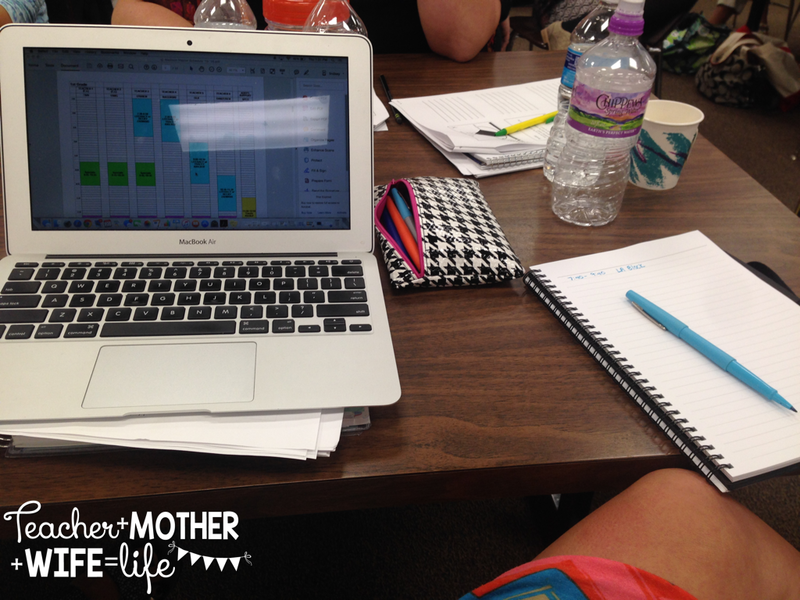 🙂 We took a look at our year long plan which was created by Traci Clausen over at Dragonflies in First. You can get it on her tpt shop here. We had our math and language arts already on the map and had to decide how/ when we were going to do science and social. Now we just need to go back in and put the different standards that we will be covering each week. I seriously LOVE this year long planner, and like I said in an earlier scope you should definitely check it out!! I wanted to wrap it up by showing you this must have app that I discovered yesterday afternoon. 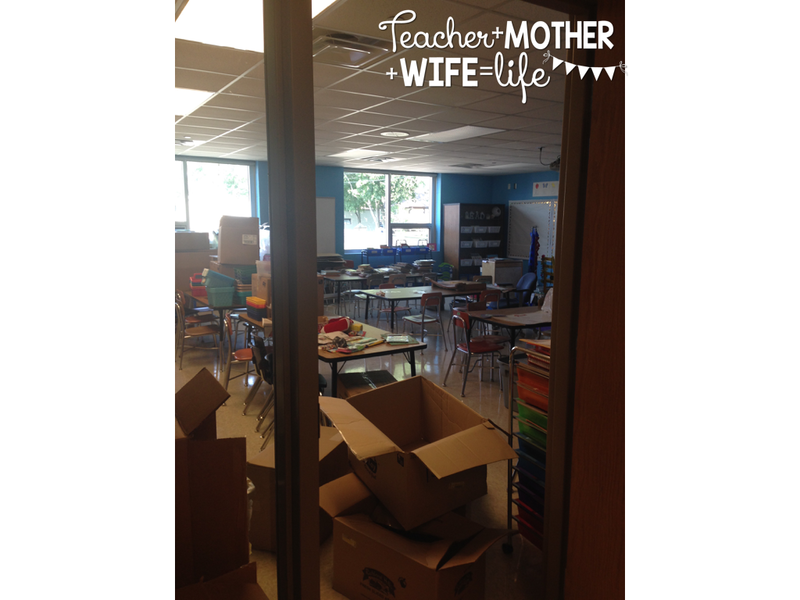 I think we can all agree that leveling our classroom library is a bit of a chore. Last year I used Scholastics app (and in previous years I’ve sat on the Scholastic website and typed the titles in one by one), but a very large portion of my books weren’t in their database. 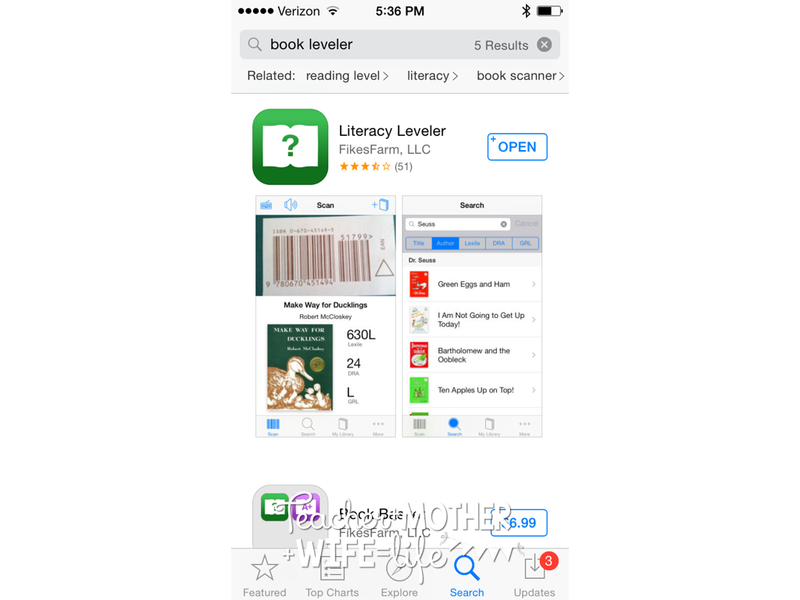 I searched for a new one yesterday and came across this- Literacy Leveler. This is a paid app- $3.99, but it was well worth it! It simply scans the ISBN barcode and tells you the Lexile, DRA, and Guided Reading levels! It was SO fast you guys! There were still a handful of books that were not in the database, but it was significantly fewer than what I’ve encountered in previous years. If you have a lot of leveling to do you NEED this app! Well, that’s about it for this week! I am going to take the weekend and try not to think about school stuff- before I know it Monday will be here and I will be in for another long week! I hope that you all enjoy your weekend as well!! Oh wow that app looks awesome!! I've got to get that!! Hang in there…..I so get what you've been through!! Hope your open house goes well!! Linda's Learning Loot!! Yes! You need the app! Is it wrong that I want to level my own kids books at home with it? lol It made things SO much easier. 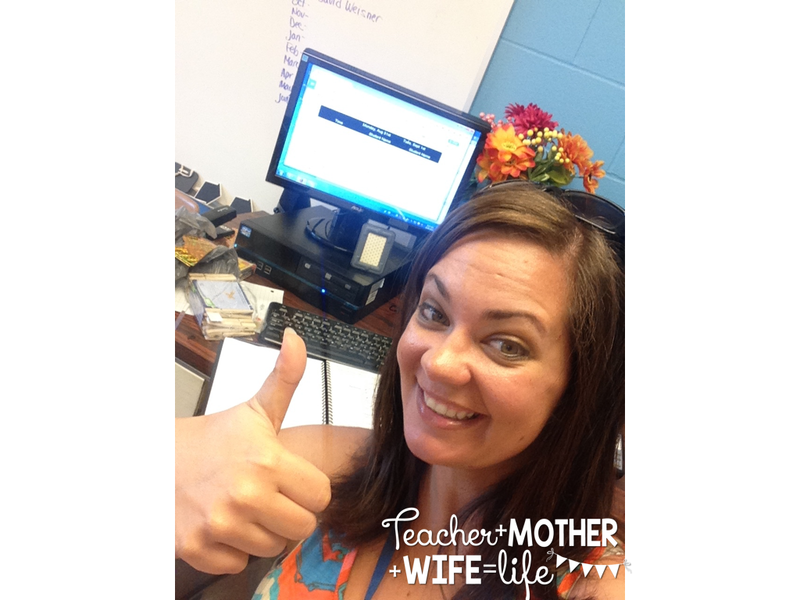 I wish that app existed back when I was leveling my entire classroom library…that was a chore! I'm back to school tomorrow and I am soooooo nervous! HA! Glad you are feeling so good about your new school!